Heat oven to 375°F. Make drop cookie dough as directed on pouch. Shape 3 (1/4-cup) balls (2 inches in diameter) from dough. Shape 3 more balls using 3 level tablespoons dough (1 7/8 inches in diameter) for each ball. Place all 6 balls on ungreased cookie sheet. Bake 10 to 12 minutes or until edges are light brown. Cool 3 minutes; remove from cookie sheet to cooling rack. Meanwhile, shape 3 balls using 2 tablespoons dough (1 3/4 inches in diameter) for each ball. Shape 3 balls using rounded tablespoon dough (1 1/2 inches in diameter) for each ball. Place all 6 balls on ungreased cookie sheet. Bake 9 to 11 minutes or until edges are light brown. Cool 2 minutes; remove from cookie sheet to cooling rack. Continue with remaining dough to make 3 balls of each of the following diameters: 1 1/4 inches, 1 inch, 3/4 inch and 1/2 inch. Place on ungreased cookie sheet. Bake 6 to 8 minutes or until edges are light brown. Cool 1 minute; remove from cookie sheet to cooling rack. Cool all cookies completely, about 30 minutes. Each tree will be a stack of 8 different size cookies. 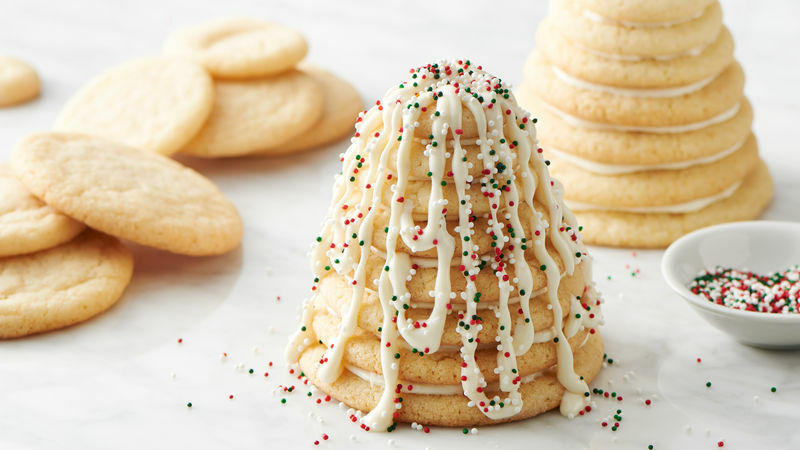 To assemble 3 trees, stack cookies on serving platter, starting with largest size cookie on bottom, and stacking each smaller size cookie on top, spreading frosting between each layer before stacking. Heat remaining frosting in microwavable bowl uncovered on High 10 to 15 seconds or until frosting can be stirred smooth. Drizzle over trees, and garnish with sprinkles. Sprinkle powdered sugar on platter to look like snow. A kitchen ruler is helpful to make sure cookie dough balls are the correct size.